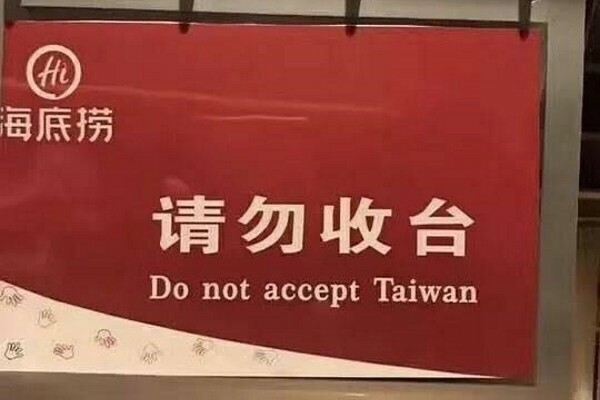 Language Log » "Do not accept Taiwan"
Source: "Photo of the Day: 'Do not accept Taiwan': Botched Baidu English translation of sign at popular Chinese hotpot restaurant makes odd political statement about Taiwan", by Keoni Everington, Taiwan News, Staff Writer (1/29/19). Google Translate: "Do not accept the station". Microsoft Translator: "Do not accept the table". This all comes from the desire to wax literary on the part of the person(s) responsible for the wording on the sign. As I've stated numerous times in earlier Language Log posts, machine translators of Chinese are not designed to handle Literary Sinitic / Classical Chinese. — all of which mean roughly the same thing: "Please don't clean up the table". Moral of the story: you are less likely to confuse humans and machines if you write in vernacular. "qǐng wù shōu tái 请勿收台"
"This all comes from the desire to wax literary on the part of the person(s) responsible for the wording on the sign. As I've stated numerous times in earlier Language Log posts, machine translators of Chinese are not designed to handle Literary Sinitic / Classical Chinese. — all of which mean roughly the same thing: "Please don't clean up the table"." Even though I spoke Chinese in the house in the US I would never had understood the former if someone said that to me. Now after living here in China I can pause and understand. Ha, someone is watching: I just tried 請勿收台 at Baidu Fanyi and it now also comes out as "Please don't clean up the table". However, translations into other languages haven't been completely purged: 请勿收台 gives "ikke tæt på taiwan" in Danish, "Bitte nicht in Taiwan" in German, and "inte nära taiwan" in Swedish. The rest of the languages produce various gibberish, but no Taiwan. I wonder if this tells us anything about whether Baidu Fanyi uses internal hub languages? @ktschwarz, if the article is correct that "Chinese censors quickly went into action … and ordered Baidu Fanyi to change their translation to this", they probably just added a statement to check for this exact phrase. I wonder if we can produce Taiwan from some other combination of characters including 台 where it refers to table/platform. @Alex, not sure why it is crazy that your Chinese broadens after moving to China. Presumably in the US you learned it from family and if they only speak in a certain way that's what you will learn, but when in China you encounter many different manners of speech which may originate from multiple topolects. I'm not sure if 收台 is "proper" Cantonese but I would understand it if it was said to me, and I think I've heard it used in HK. But I am more inclined to use the verb 執 instead of 收. Speaking as someone from high-wage, self-service, automated Sweden, which is full of signs politely requesting you to clean up your own mess: Why am I told *not* to clean up the table?